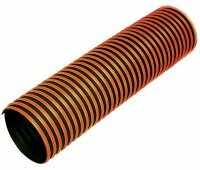 This flame retardant welding fume extraction duct and cable cover is designed specifically for welding environments including sparks and slag. Manufactured without solvents, glues or adhesives, SF TPR provides outstanding performance and fatigue resistance. Ideal for use a s flame retardant protective jacket for cables, beverage lines etc. Colour: Black with Orange wear strip* available with and without encapsulated wire.